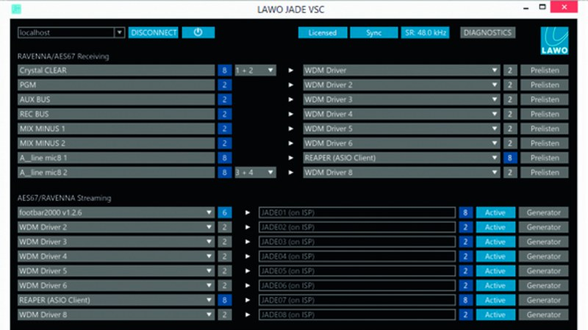 R3LAY VSC is Lawo’s new virtual soundcard solution. It provides 64 channels bi-directional RAVENNA and true AES67 streaming in the Microsoft Windows environment and supplies multiple WDM drivers and an ASIO driver that can be loaded by more than one application at the same time. It also features advanced realtime broadcast-quality sample rate conversion, especially important when using content of a different sample rate than the network. Broadcasters running larger plants will love the fact that they can access drivers remotely via a separate control application. R3LAY VSC gives broadcast software developers the ability to make their products comply with the AES67 networking standard quickly and easily.